Please accept this belated thank-you letter on behalf of the Rangely High School class of 1999. Last month was our 10-year reunion, and we would like to thank everyone who helped make our class reunion a success. A special thank you to White River Market (and Bakery) for its donations; Cedar Ridges for allowing us to do a golf scramble for the occasion; Herald Times for announcing the reunion; Kari Way, Beth Scoggins, and the In Step Youth Group for being available for babysitting services; and Mr. Jeff Miller, our class sponsor, who willingly agreed to attend (and grill for) our barbecue. Thank you also to Ace High Restaurant and Main Street Pub for welcoming our class. We had a wonderful turnout, and a great time was enjoyed by all. 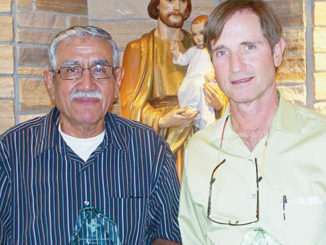 Rangely’s Juan Chumacero, Sr., left, and Colorado Mesa University Spanish professor Tom Acker, left, were recognized for their service to sheepherders and other Hispanic immigrant groups on June 23.